JACK Petruccelle was prepared for it. And just as his interview with the Magpies’ recruiting team was finishing up, the left-field question he was anticipating came. “Collingwood showed me a picture full of cars and they asked me what car I’m most like. That was a bit of a weird one,” Petruccelle tells foxfooty.com.au. Forced to think on his feet, Petruccelle’s eyes quickly deviated to the long red one — and for good reason. “I chose the Ferrari — I just chose the quick one,” he laughs. While his answer could be seen as light-hearted, it’s also spot on. If you had to pick out a Ferrari from this year’s draft class, Petruccelle, who looms as a possible second-round pick in the national draft later this month, is the most appropriate. And that’s not just because of his Italian heritage. Petruccelle has wheels. He is officially the fastest player of this year’s crop, clocking the best 20m sprint time (2.87 seconds) of all draftees at the recent national combine. “I love the 20,” he laughs. As well as speed, Petruccelle has ample traits that make it hard for on-lookers to take their eyes off him on a footy field. 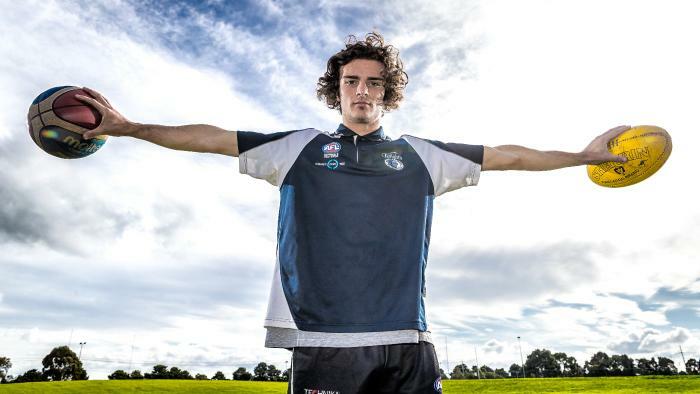 The big mop of hair helps, but Northern Knights talent manager Rhy Gieschen says Petruccelle’s “freakish ability” makes him a special player. “We know he’s quick, but what he was able to show was that he’s got some really quality footy crafts. He’s a pretty natural player,” Gieschen tells foxfooty.com.au. What makes Petruccelle’s rise so hard to fathom is that he was relatively unknown to many AFL club recruiters just over a year ago. While Petruccelle loved his footy — and his Carlton Blues — as a kid, arguably his first love was basketball — a sport he started playing when he was four-years-old. And he was darn good at it. A gun point guard, he was part of the AIS Academy and played in national competitions alongside the likes of Jack Perry and Jack White — both have linked up with US colleges in recent years. He was also starting to receive scholarship offers. Petruccelle claims he couldn’t have gone much further in basketball — “maybe I could’ve made a SEABL team” — but still a professional footy career wasn’t near the top of the priorities list. Then the Northern Knights came knocking midway through 2016. And Petruccelle’s life would quickly change. The TAC Cup club held a mid-year trial game for Under 17 players not in the squad. Petruccelle, who had shown glimpses of his footy talent playing junior games for Epping, was invited down to play. Gieschen claims the Knights had seen enough by quarter-time. For Petruccelle, though, he just “wanted a game of footy”. “When I went down for the game, I wasn’t expecting anything, especially them to pull me over at the end of the game and tell me that I was going straight into the squad,” he says. “It was a bit weird to be honest ... They told me that they saw a lot of potential in me and they wanted to work with me and develop my game. As encouraging as the Knights’ faith was, actually making the call to drop basketball — the sport he had dedicated so much time and energy to for the previous 12 years — was devastatingly tough. “Even the first couple of months afterwards, I was a bit down, because I thought ‘gee I haven’t picked up a basketball in two months’. That was a shock,” Petruccelle says. A year later, though, Petruccelle’s decision has undoubtedly paid dividends. The 18-year-old set himself up for a fantastic 2017 campaign thanks to his impressive pre-season attitude, with a goal to learning and understanding the game the best he could. It led to a sizzling start to his 2017 TAC Cup season, where he was named among the Knights’ best players in seven of their first eight games. Two of those matches were genuine eye-catchers. He racked up a then-career-high 27 disposals against the top-of-the-table Geelong Falcons before booting 5.1 from 18 disposals against the Gippsland Power the next week. Gieschen reckons ‘Pet’, at that stage of the year, was “performing as well as anybody in the TAC Cup — including the highly rated players”. Petruccelle had arrived. And he knew it. “Those two games were my favourite of the year,” he says. Petruccelle was then given a golden chance to enhance his draft case in June when he was selected in the final Vic Metro squad for the Under 18 national championships, before also being picked for Team Enright in the All-Stars on AFL Grand Final day. All this in a year and still Petruccelle found a way to scratch his basketball itch. Along with a close friend, he took charge of a local Under 14s basketball team as a co-coach, which he says helped his transition even more. “They were awesome,” he says with a big smile. Some AFL commentators, most notably Richmond great Kevin Bartlett, don’t like it when draft prospects’ basketball backgrounds are constantly referenced and how the court sport has helped their footy nous. “The speed I used on a basketball court can translate into footy,” he says. Throughout his emotionally-draining journey to this month’s draft, there has been no greater influence on Petruccelle than his family. His grandad, who just turned 70, has attended every game — “he’s up in Gippsland, he’s up at Murray, wherever we’re playing he’s there” — while his mum Anne and dad Stephen were rocks as Petruccelle weighed up his professional sporting future. “They just wanted me to be happy,” he says. For a kid that had never been through the full rigours of a footy program, Petruccelle’s climb has been surprisingly impressive. A proud Gieschen says AFL clubs are big fans of Petruccelle’s defensive pressure. “He’s certainly one of those players that if the opposition is trying to run the ball out of their back-half, they’ll always know that Pet is around. He’s so quick and he sneaks up on them,” Gieschen says. “I see him, early days, being that small forward who can pressure and chase and harass. Petruccelle, who believes the half-forward line is where he’s best suited, is just hoping an AFL club gives him a go. “Anywhere would be absolutely great. I’d love to play AFL footy, so hopefully I get taken — that would be awesome,” he says. “I took it and ran with it. And then to get invited to the combine — it’s all insane.